Sarah Lavender flowers are petit just like the rest of the plant. At a little over 12 inches tall Sarah Lavender makes a nice short hedge. It is also a good size for container planting. As you can see the flower receptacle is a dark purple which contributes to an overall medium purple flower color. 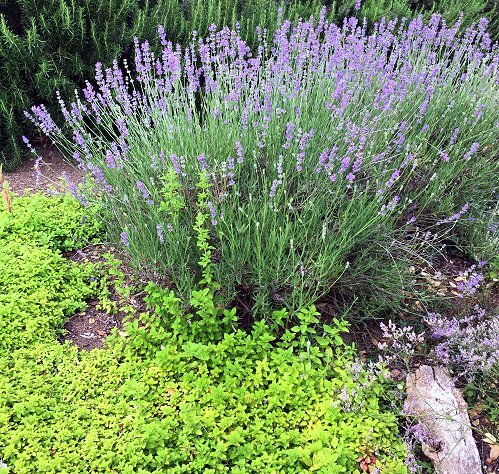 In the picture below, Creeping Golden Marjoram complements the purple lavender flowers. This plant is often available in plug trays. These trays hold 128 of all the same plant. They are a great low cost way to fill a lot of space. Each cell is 3/4 of inch by an inch. Check here to see if Sarah Lavender Plug Trays are available. 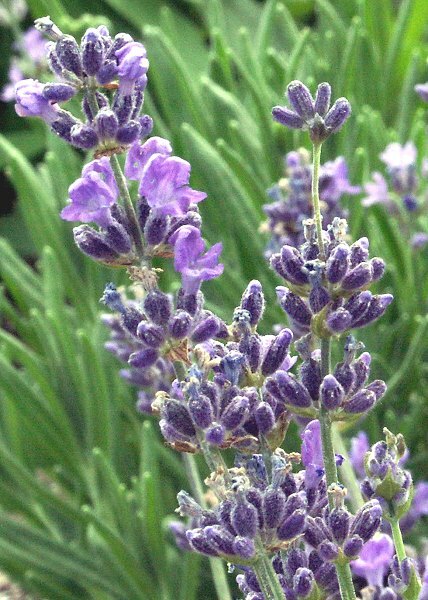 Sweet smelling, richly colored, Sarah Lavender makes a great addition to our Zone 5-11 Fragrant Herb Garden Six Pack.